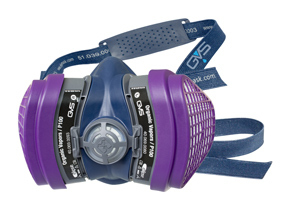 The Elipse OV/P100 Mask protects the user from Organic Vapors like those used in finishing materials. It includes two filters to give protection against organic vapors including: paint vapors, pesticides, Cyclohexane and solvents. This mask can also be used for dust as well as organic vapors. This mask is light, comfortable, and ultra compact. The design includes an exhilation valve to make breathing easier and to keep glasses from fogging. The The Elipse OV/P100 mask weighs only .96 lb and is NIOSH approved.